She’s the sun, I’m the moon. Being # 2 is great most of the time. I get it. I’ll take it. I’m not their mom. She’s the sun. 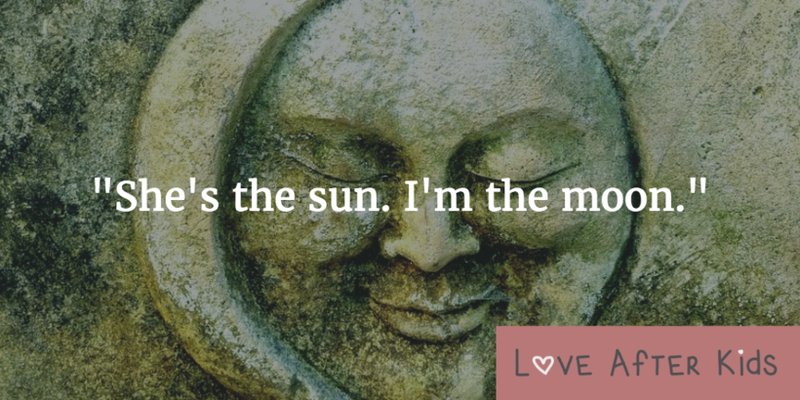 I’m the moon. I had plenty of experiences with our 12-year-old son, Eric, of being arbitrarily rejected and I’ve got to say that I dealt with it really well. I had my moments when I got fed up of pouring my heart and soul into this creature only to be summarily executed by a look in his eyes. It has been different with our 3-year-old, Emma. Deb is still # 1. There’s no doubt about that, but she hasn’t rejected me the way Eric did at her age. It made me think about what I was doing differently. I hear you, but I’m always able to cheer her up after she wakes up with some freestyle stuffed animal puppeteering. I was taken aback. She’s three after all. I didn’t think three year-olds pulled the “I want to be alone” line, but I said okay and I left her with her 50 blankets and stuffed animals. But the treatment continued. She didn’t want anything to do with me for the rest of the day with a few exceptions here and there. The next few days were similar. I backed off because my efforts just seemed to fuel the fire. I went into the bedroom and let off some steam with Deb. I was hurt and angry. I have been a constant river of love with this girl. How dare she reject me like this. I don’t want to deal with this again. You get the picture. There’s this internal three-way conversation going on between my punitive/critical voice, wounded and angry child and my healthy adult voice. The healthy adult stepped in to make sure I didn’t react impulsively with Emma. He also put that punitive voice in its place by validating the angry and wounded child. That created space for those feelings to exist without being dismissed, shamed and shooed away. When the feelings have the space to exist, they don’t have to morph into other more persistent states as a result of pushing them away. I made this process a lot tidier than it can be. I am still feeling wounded. I know the deal. I see it happening, but it still hurts and that’s okay. We played together this morning. I was Mater and she was Lightning McQueen. Then I tried to hold her hand. She said no. Then I said: “Lightning, can you hold Mater’s hand?” That worked. Mater it is, I guess. Just don’t demote me to # 3! Originally published at www.huffingtonpost.com on March 1, 2017.